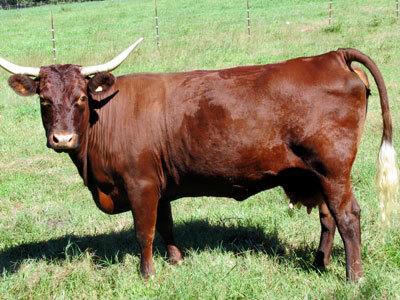 OGF offspring from three separate bulls (Allen, Trailblazer & Confederate) did exceptionally well in the October Regional AMD show where ten breeders, exhibiting 31 AMD, competed for top honors. 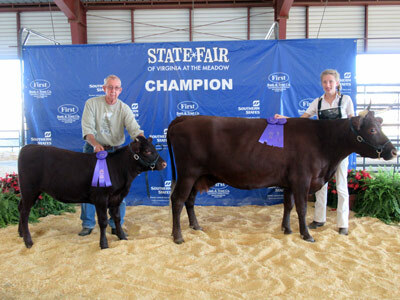 OGF also placed first in the Dam & Daughter and Breeders Herd classes. OGF recieved the Premier Breeder Award, based on cumulated points. 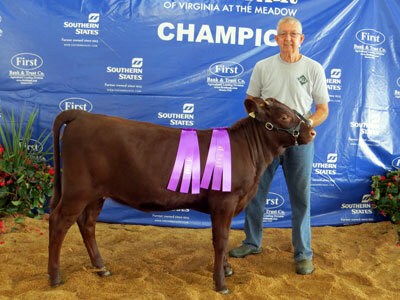 In the Virginia State Fair Dairy Show, Mercy was selected as the Senior Champion and Grand Champion Female. 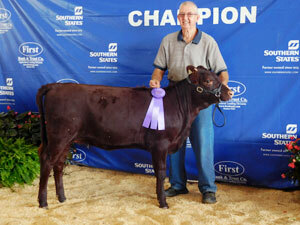 OGF Virginia Constantina was awarded Junior Champion Female. Participating for the first time in the Virginia State Fair Dairy Show, OGF Carolina Borgia was selected as Junior Champion and Grand Champion. 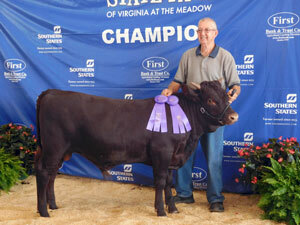 OGF Carolina Bonnie was awarded Reserve Junior Champion. 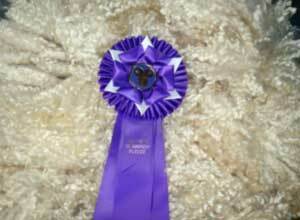 Best Fleece in Show (OGF Mathew) in the White Longwool division. Kadi and Luke had a fantastic show at the 2017 Festival. Competing against 17 other Longwool breeders, together they received nine blue ribbons, Champion Ram, Best Fleece in Show (OGF Lincoln) and Champion Ewe (OGF Laura) in the white Longwool division and Reserve Champion Ram and Best Fleece in Show (OGF Lucas) in the colored Longwool division. They were also awarded the Premier Exhibitor Award. Grandson Luke joined his sister Kadi in the show ring at the 2016 Festival. Competing against 13 other longwool breeders, together they received eight blue ribbons, Champion Ram and Best Fleece in Show (OGF Karnak) in the white longwool division and Reserve Champion Ram and Best Fleece in Show (OGF Kendel) in the colored longwool division. 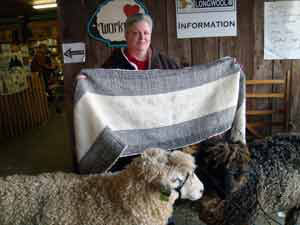 In the Fleece Show, OGF was honored with: Best Leicester Longwool Fleece awards in both the white and colored longwool divisions. In 2015 OGF turned a page in its breeds’ conservation plan with our granddaughter Kadi showing sheep for the first time. 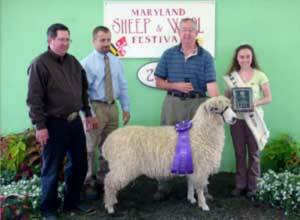 Her efforts were rewarded with OGF Jefferson receiving the Best Fleece in Show honors in the white longwool division. We are honored that for the 8th consecutive year an OGF yearling was selected for the Best Fleece in Show honors in the white longwool division at the 2013 MS&WF. We are particularly pleased that for the second time (2011) in the past four years an OGF ram was selected for the Supreme Champion Fleece award from over 1,200 sheep at the Maryland Sheep & Wool Festival (MS&WF). 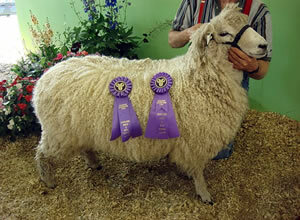 Below is a summary of awards that OGF sheep have garnered in the past eight years. We are sometimes asked, how much weight should a prospective buyer give to the show record of an individual ewe or ram? The answer is simple. On a particular day, that individual animal was the best in the ring in the professional opinion of a judge. 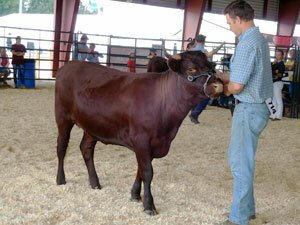 The results of one show are not necessarily a guarantee of quality breeding or superior genetics. Cumulatively, over a period of years, show results can be a reliable predictor of a high probability of genetic replication. 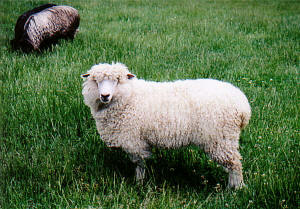 Simply stated, a flock that consistently places at or near the top of its classes, representing the professional opinion of many judges over many years (and thus successive generations of sheep), offers a much greater likelihood that the offspring from this flock will be the same high quality as the individual ram or ewes you are considering purchasing. 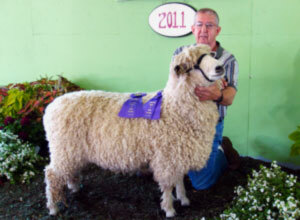 For an unprecedented fifth consecutive year (2006 – 2010), OGF received the Best Fleece in Show honors with OGF Sir Edmond at the Maryland Sheep & Wool Festival (MS&WF). 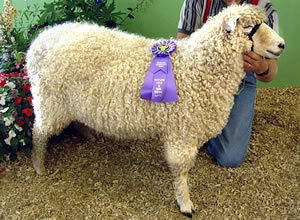 He was also named the white longwool Champion Ram. 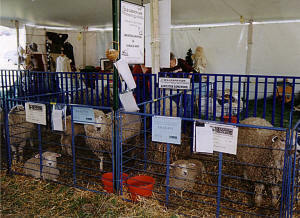 OGF Leicester Longwools continued their tradition of excellence at two major fleece festivals in 2009. 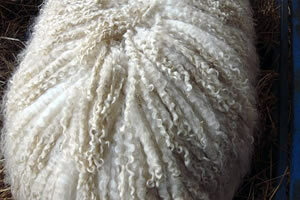 For the forth consecutive year one of our yearlings(OGF Dante)was selected as the Best Fleece in Show, white longwool, at the 2009 Maryland Sheep & Wool Festival (MS&WF). 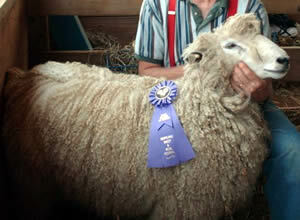 OGF Dante was also awarded Best Leicester Longwool Fleece at the New York State Sheep & Wool Festival. OGF Dante, Darwin and Duncan received three of only five Blue Cards (Excellent) awarded to yearling rams & ewes at the 2nd National Leicester Longwool Card-Grading Exhibition at Rhinebeck, NY in October. Our two ewe lambs, OGF Eleanor and Emma were awarded a Blue Card (Excellent) and a Red Card (Good) respectively. Each sheep was evaluated individually by the three judge panel - Lee Parson from England, Brenton Heazlewood from Australia and Dr. Sponenberg from Virginia Tech. Below OGF Duncan is evaluated for his Blue Card. Perhaps the most exciting event for us at Rhinebeck was watching the First-Sunday Group use a white and two colored OGF fleeces to card, spin, and weave their way to a second place award in the Fleece-to-Shawl competition. OGF Dante and Darwin inspect the completed shawl, held by Bonnie Warwick, made from their spring fleeces. If you are not familiar with the MS&WF, more than 1,200 wool-breed sheep, exhibited by approximately 200 breeders from around the country, compete for honors in 17 individual breed shows at the Festival. 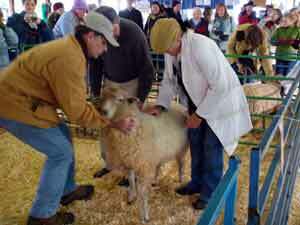 At the conclusion of each breed show one sheep is selected Best Fleece-in Show. 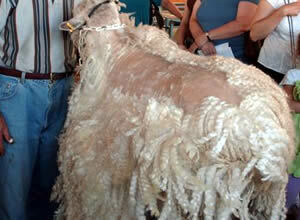 At the conclusion of the Festival the 17 Best Fleece-in Show animals competed for the Supreme Champion Fleece award. 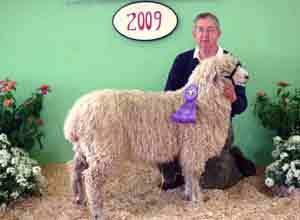 Champion Ram and Best Fleece-in Show – White Long Wool OGF "Churchill"
2008 was the third consecutive year that our Leicester Longwools were singled out for their superior fleeces at the MS&WF. 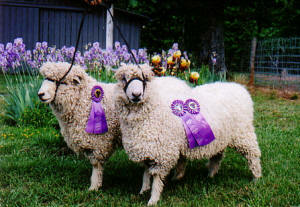 OGF Annabelle (R 483) and OGF Lord Applebee (R 10214) received the Best Fleece-in Show awards for the White Long Wool shows in 2006 and 2007. 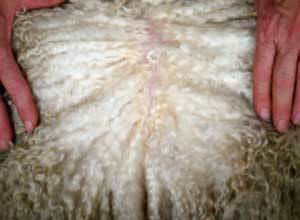 Our breeding for quality has been consistently recognized throughout our three years of showing Leicester Longwools. 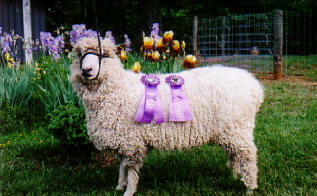 Reserve Champion Ram, "OGF Prince Albert"
Reserve Champion Ewe & Best Fleece of Show, "OGF Annabelle"
An OGF Leicester Longwool fleece was awarded "Best of Show" at the 2006 Virginia State Fair. OGF participated in the 15th Anniversary Celebration of the reintroduction of Leicester Longwool Sheep into the U.S. held at the 2005 MS&WF. The highlight of the Celebration was the "card grading" of the 35 Leicester Longwools exhibited by 13 LLSBA members. Three judges from New Zealand, England and Virginia Tech judged each animal against the breed standard and awarded either a blue card (Excellent), red card (Good), yellow card (Acceptable) or white card (Unacceptable). 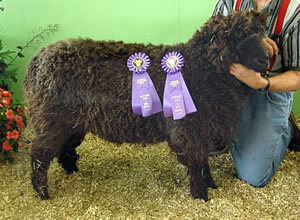 OGF was pleased to receive blue cards on both of its two ewes: CWL Freedom and CWL Liberty. 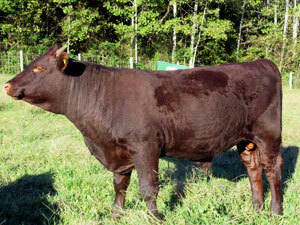 We can deliver breeding stock to either of the above events.